You are here: Home / Community & News / Work it! It is Women’s Health Week. So let us talk about pelvic floor and core stability. More than 70% of people who experience incontinence are women. Firstly, where is this pelvic floor and what do they do? Your pelvis is shaped liked a bowl with no bottom. 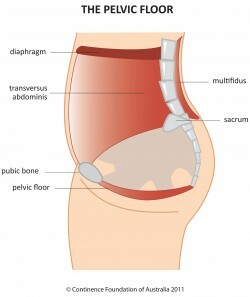 The pelvic floor is a sling of muscles that lines the base of the bowl. They provide support to the organs that lie on it. They contain the sphincters that give up bladder and bowel control. They are important for sexual function for both men and women. In pregnancy, they provide support for the baby and assist in the birthing process. They also work with the abdominal and back muscles to stabilize and support the spine. Ok, so we know a bit more anatomy that we did before. Now what are some causes of a weakened pelvic floor and core? But you should also know something can be done about it! You can work on your pelvic floor and core in a number ways. Start while laying down, sitting or standing by squeezing the pelvic floor, so you get a lifting sensation. This is a similar action to preventing yourself from passing urine and/or gas. Secondly, sitting tall place your hands on your hip bones. Walk them towards your belly button, about 5cm and press in. If it is soft under your fingers then your lower abdominals are not engaged. Gently draw your lower abdominals in underneath your fingers. You should get instant feedback with a sensation of hardening or tightening under the fingers. This is your transverse abdominus that provides stability for your lower back and pelvis region. Now, try activating both regions together. This is a process requiring patience and commitment. It does not all happen overnight but through regular practice. If you are needing further assistance in locating and activating these areas we provide external Abdominal and Pelvic Floor Assessments with an ultrasound machine. You will see on a screen which muscles are activating and what key phrases work for you to achieve the correct function. Once you have establish the correct patterning for contraction we also offer Clinical Pilates on Monday evenings 6-7pm at the City Clinic. This class serves as a progression in your capacity to use and strengthen the area. Bookings for assessments and Pilates are essential.